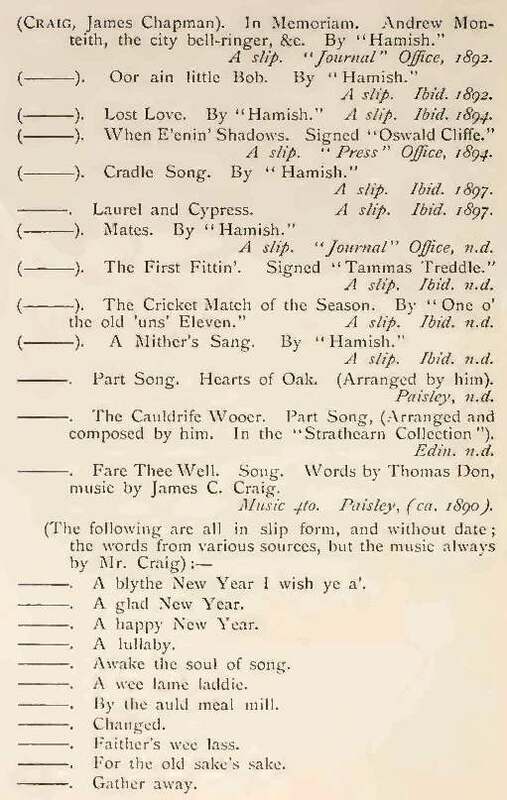 Confectioner Poet and Composer/Arranger of music for many Scottish songs. James Chapman Craig was born on the 20th of November, 1859, in New Row, Dunfermline, Fife, Scotland to James Craig (Confectioner) and Catherine Chapman who married in Dunfermline on the 2nd of March, 1858. James Jnr. was one of nine children born to James Snr. and Catherine by 1873 – the others being, Thomas, Mary, Isabella, Robert, John, a second Thomas on the death of the first Thomas, Ann and Robina. By 1881 the family had settled in 129 1/2 High Street, Dunfermline and comprised, James CRAIG aged 45 (Confectioner Employing 2 Men) born in Pathhead, Fife; Catherine Chapman CRAIG his wife aged 44 born in Dunfermline, Fife; James Chapman CRAIG (Confectioner) his son aged 21 born in Dunfermline, Fife; Isabella Oswald CRAIG (Confectioner’s Shopkeeper) his daughter aged 18 born in Dunfermline, Fife; Ann Chapman CRAIG (At School) his daughter aged 9 born in Dysart, Fife; and Robina CRAIG (At School) his daughter aged 7 born in Dunfermline, Fife. James Chapman Craig married Isabella Mitchell Younger in Dunfermline in 1883, and, by 1891, at 131 High Street, Dunfermline, their family comprised, himself, aged 31 (Confectioner and Pastry Baker), his wife Isabella, aged 31, son James aged 7, son Alexander aged 6, daughter Isabella aged 3 and son Robert aged 2. By 1901, then at 133 High Street, Dunfermline, two more children had been born to James and Isabella, namely, William then aged 9 and Jane then aged 2. 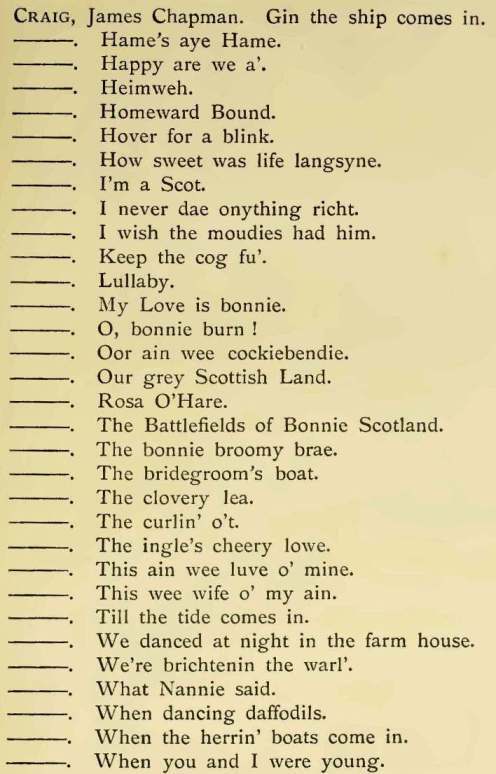 It appears that sometime after 1901, James Chapman Craig published his collected works under the title, ‘Sangs O Bairns An Hame’, and fortunately, having found a rough manuscript copy of his book of poems, we at Electric Scotland in 2009, can now share them with others around the world. 8. THE PHILOSOPHY OF MIRTH: HA, HA, HA!